Posted on April 7, 2014 by Elizabeth E.
Yippe Skippee!! It’s a giveaway over here at OPQuilt.com and I’ve got two prizes for you to choose from. Of course you could say either, and that’s just fine too. Our citrus trees are bursting with limes, lemons and oranges all over Southern California, so I thought it only natural to put together a little something to celebrate Spring’s bounty, from our part of the world: a stack of six fat quarters in citrusy patterns and colors (and even one with homemade lemonade all over it). Add in three different spools of Rainbows thread from Superior Thread, and . . .
. . . a shapely little orange peeler that will help you zip off those skins to get to the eating (not recommended for kumquats — see below). They are waaaay too small. The thread behaves like a rayon, with a nice sheen and good color variegation, but it’s a trilobal polyester, and Superior’s great quality. So that’s Giveaway #1. 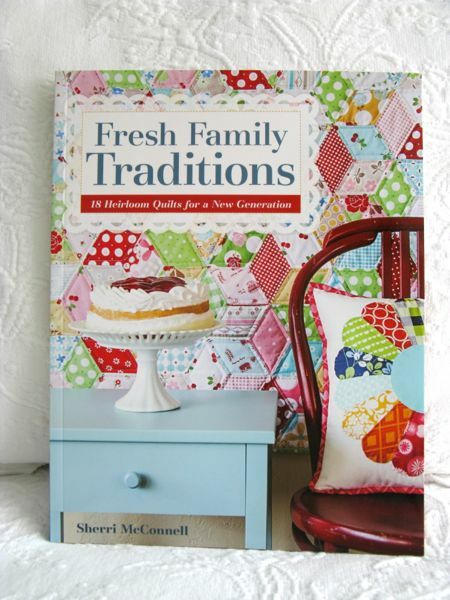 Giveaway #2 is Sherri McConnell’s latest book, Fresh Family Traditions. Somehow I ordered two, so that means I can give away one to you! In your comment, choose between the book or the fabric/thread, and leave me a comment telling me your favorite citrus fruit and how you like to prepare it (lemon shortbread? orange chicken? lime coolers? homemade lemonade?). This opens now, on Monday, April 7th, and will close on Wednesday, April 9th. Followers are entered in twice, so if you’re not a follower, come and join us. 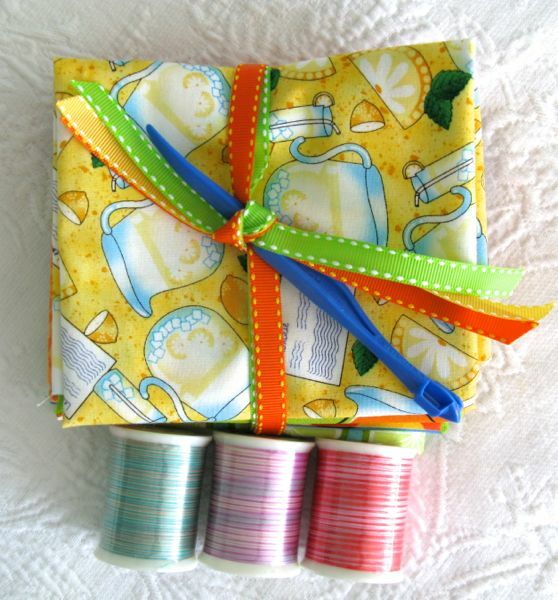 I hope you win a little sunshiney pack of fabrics, or a sweet new book from Sherri McConnell! Thanks to all who entered. Giveaway now closed. You know the saying, “beggars can’t be choosers!” Well, I’m not choosy, but probably begging- either of these are wonderful! I love lemon tart and orange poppy seed muffins! Thanks for the chance to win! How wonderful!!! Both prizes look fantastic but I really love those fabrics and threads!! 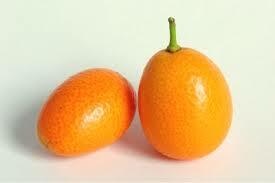 My favorite citrus would have to be mandarins. Thank you for your generosity!!! I am following you as an email subscriber and via Bloglovin’…. Thanks again!! I follow you through Feedly…Hope that still counts :o) Thanks!! I am a follower on Bloglovin! Mango salsa. Yummy! Definitely loving the fabric and thread. Love the color inspiration from California but I would love to win Sherri’s book. I have been meaning to order it. Thank you for the chance. Thanks for two fabulous giveaways! I’d be thrilled to win either! What fun give aways! If I win, can we have a quilt day? I love the book, but the fabric would always remind me of spring in California. I follow you through Feedly. Does that count? The book looks great! I love limes, spritzed in club soda. Or lemon chicken. 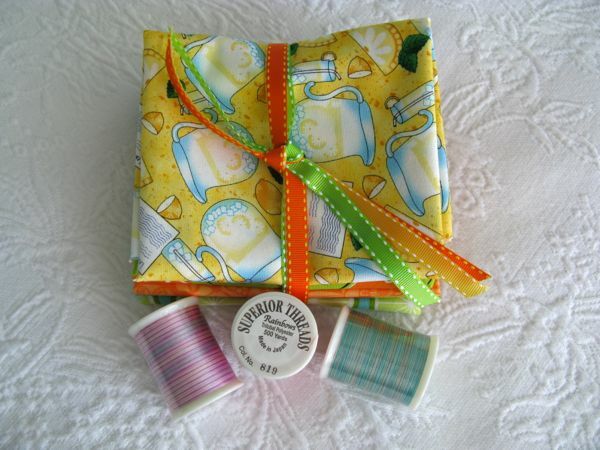 I am loving the lemonade fabric bundle! We drink lots of lemonade and orange juice here, we also had lemon zest and orange zest to our desserts, like baklava. I would love either gift! Lemons are my favorite citrus fruit…really like fresh lemonade. Thank you so much for the giveaway. I’d choose the book. And I love everything citrus… but my hands down favorite is cilantro lime chicken in the crock pot. Lemon is my favorite! I use it in cakes mostly! I used a zested sugar are real zest from a lemon. I would be happy with either but since I haven’t bought the book yet I’ll go for that. What a happy giveaway, Elizabeth! I would love the fabric, the colors are so fresh and bright…I love all citrus fruit, but lemon meringue pie is my hubby’s absolute favorite treat, so in his honor, I choose that as the treat I make with lemons. Surprise me! I am always open for something new and maybe different from what I have. I love grapefruit. I just cut it in half and eat it right out of the rind. I would love the fabric/thread. Thanks! Citrus, sunshine – what wonderful fabric. Thread isn’t bad either but I really like the fabric. I can’t really eat citrus but ever so often I will buy some lime and make key lime cheesecake. My family loves them. I would love to win the fabrics and threads. I’d love to check out a new book! I really love oranges but I usually buy the little clementines since they are so much easier to peel! I would love either. Thank you so much for your generosity! Either one I am not picky. Thanks for the giveaway! My favorite citrus at the moment is Key Lime! I love adding Key Lime to my tea or greek yogurt! I would love the fabric bundle. If I have to chose I will pick the fabric and thread. My favorite citrus are Meyer lemons. I am trying to grow my own tree. I love making lemon shortbread cookies. thanks for the giveaway. Cute fabric!!! I love to make homemade orange juice. My grandparents live in Florida and have plenty of orange trees in their backyard. Fresh squeezed juice always has the most pulp. Yum! I love lemon poppy seed muffins. But lemon iced cake sounds delicious too, and you sure can’t beet fresh lemonade on a hot summer’s day! Mmm… I can’t wait for summer to get here. Thanks for the chance to win! I prefer the fabric and thread. I follow via email at kdavis1@centurytel.net. I like grapefruit the best with a little grenadine poured on it. Thanks for the chance to enter, I would love either prize. Both prizes look wonderful and I would be thrilled to win either one. Thanks for the chance! My favorite citrus fruit is an orange and I like to eat them straight up. you are too too lucky to have citrus fruit growing in your garden, we lived in Seville for a year and I remember the orange trees along the street, the flowers smelled wonderful! I found some Seville oranges many years later and made marmalade, it was so easy! Thanks for the giveaway either is fine with me! Thank you for the chance on either of the items. I would find the fabric giveaway very useful. I enjoy all citrus, Clementines for easy peeling but oranges are great too. Hard to choose on both counts – I do love orange marmalade a lot! And I love the look of the book but that thread has caught my eye and would be fun to try out! So fabric and thread! thanks! I am a new follower Bloglovin! thank you again! I love grapefruit. My favorite way? Juiced with vodka, of course! I’d love the book! I’d love to try superior threads, and I think lemon in desserts is my favorite. It’s hard to say from there – lemon pie, lemon bars, lemon tarts. I love them all! Oh, I want that lemonade fabric! It only makes sense!! Favorite citrus…Cuties! I love, love following you! I love lemon in desserts- lemon meringue pie is my favorite, followed by lemon bars! I would be happy with either prize, but my favorite is the fabric. Love kitchen themed fabric and these are so cute. Lemons! I love lemon bars. I’d prefer the fabric bundle giveaway. That fabric is too delightful not to choose. Thank you for the giveaway!! I would like prize #1. I love the vibrant colors in the fabric. I like limeades so the lime fabric would fit right in with my tastes. I follow your blog on Bloglovin’. I’d love the fabric and thread. The citrus fabric is awesome. I like lemons and use them in lemonade and lemon squares. Would love either prize–thank you! My favorite citrus recipes: Lemon Blueberry Tea Bread-fav spring/summer gift, and a Lime marinade for Grilled Chicken. Yum. I will be glad to share recipes if I win! Either would be great, thanks for the giveaway! My favorite cookies are lemon bars and I also love lemon meringue pie, oh and key lime pie too! Thanks for the giveaway! I would prefer the fabric but would be happy with the book as well. I love the citrusy fabrics and shiny thread! I’ve been known to make a fabulous lemon meringue pie, but now I’m off sugar, so a squeeze of lemon in my sparkling water is a favorite! Giveaway #1 would be my choice. I especially like lemons and like to use them to make lemonade, or salad dressing, or lemon squares. Just found your blog while googling inspiration for a gingham quilt. How fun! And then to find a giveaway, too! I think I’d like any of the fabrics if I were to win. My favorite citrus is grapefruit…eat one every morning. Thanks a bunch! I would prefer the fabric/thread prize. My favorite citrus fruit is lemons. I like them i iced team, lemonade, and sounds weird but even in salad. KUMQUATS picked fresh from your tree are the most delicious!!!! I will jump for joy if I win ANYTHING. Actually….. I will do the Quilters Conga when I win. i love that fabric! I’m BRAND NEW to quilting, so I’m trying to build up my stash! thanks for the chance to win! I love oranges, straight up! Thank you for the chance to win either giveaway! What delightful fabric and thread. Yes, it definitely reminds me of Southern California! I wish I were there right now – it’s still cold here in Wisconsin. My favorite citrus creation is salmon with a lime marinade. Thanks for sharing your goodies! I follow your delightful blog via Bloglovin. Thanks for all the inspiration! I’d love the fabric and thread. As for citrus fruit: lemons. Mile High Lemon Meringue Pie. Or Lemon Loaf with Lemon Glaze. Or…Lemon Tarts with homemade lemon curd. Yummy! I follow you through my yahoo blog feed and I really enjoy your posts. For the longest time I thought the pic at the top of your header was you! How surprised I was to find out you are much younger, it was a very nice tribute. I would love the fabric… I LOVE lemons… Lemon water, lemon curd, lemon pie, lemon anything! My favourite citrus fruit is a lemon, I love making lemon curd tea cake. I’d love a copy of the book, is the giveaway open internationally? I’m in the UK. Please enter me for giveaway #1. I love all citrus. Lemon meringue pie is especially yummy! I would love to win either one of these giveaway goodies. Have read reviews of the book and it looks great; the fabric and thread collection looks like awesome fun to play with. My favorite fruit has to be clementines/mandarins. I eat them by the handful — grab three or four and just nosh right through them. And I do follow you by e-mail. I would love to read that book while eating a lemon bar. I like oranges, just peel and eat. I forgot, I would love the fabrics and thread. I like making fresh lemonade. I would be pleased with the fabric and thread. Thanks for the giveaway. 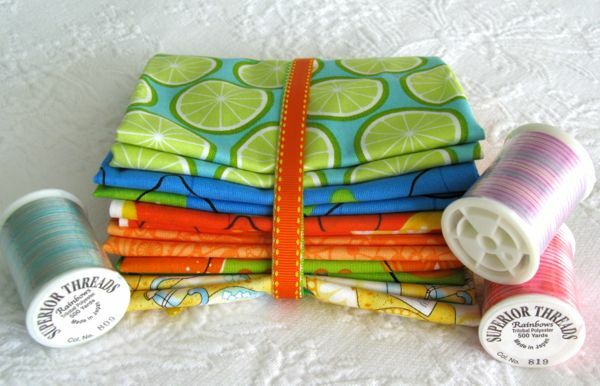 Tangy lime would make me happy while getting some inspiration from a quilting giveaway.